In the e-learning world, we’re always talking about presenting subject matter to learners in a more exciting, engaging way rather than just telling them about it. But when it comes to explaining to potential clients what we do, we don’t always practice what we preach. In this week’s e-learning challenge, David Anderson asked us to create an interactive portfolio or resume, so I got to work. I actually already had created a beautiful image of a parrot in flight over a rain forest, and I thought that would be a great image to illustrate creative impulses taking flight. I’ve always found the whole business of choosing a palette of colors most challenging. To help with this, I used the eyedropper tool in Storyline, clicking on different parts of the bird and trees in the background picture to get my colors for the menu items and then added a 50% transparency for depth. For the Storyline Player, I used the light blue color of the bird’s feathers. 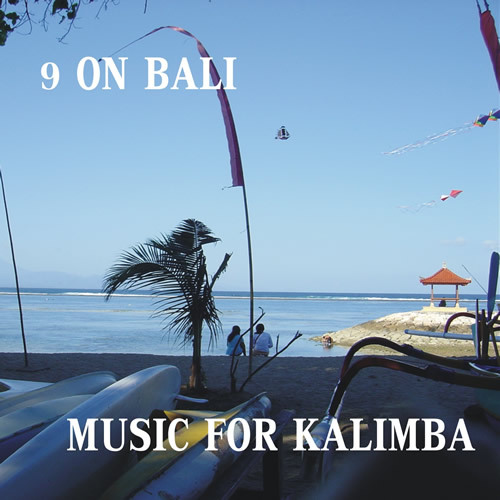 I’m a musician, and a couple years back I had recorded a CD of all original kalimba music. Since kalimbas are often made and played in tropical places, I knew a little sample from one of the songs would work just perfectly with the theme. A lot of people are afraid to use more exotic images in their e-learning courses because they’re worried their corporate clients will want a more buttoned-down professional look. But I think those concerns are not only given too much weight, but also can lead to some pretty stuffy, uninspired e-learning modules. 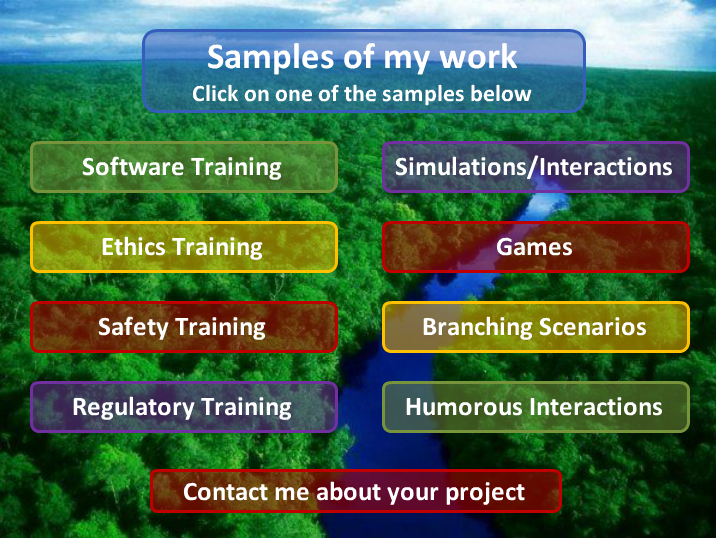 I broke up my work into two columns: one that focused on the type of subject matter (software, ethics, safety, regulatory) and the other on the type of interaction (games, humorous interactions, simulations, branching scenarios). When they clicked on one, they could read a little explanation about why and how I did it or they could just skip right to playing the sample itself (the “show” part). For anyone who wanted to see my resume, what software I used, or my blog, they could find those links on the upper right of the Player. And finally, on the bottom of the menu I had a link to a easy-to-complete contact form if they wanted to talk to me about working on a project. I hope my experience in creating this different sort of portfolio inspires you to stretch out and get a little more imaginative. I know it’s work, but that doesn’t mean it can’t be any fun. e-learning modules that offer the learner the opportunity to practice what they’ve learned. 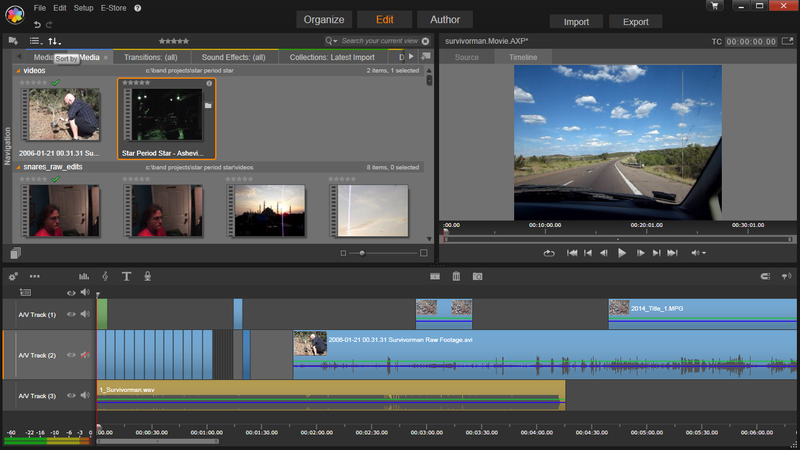 To demonstrate how this might work, I created a short sample module of how to use the Player in Pinnacle’s Studio 17 video editing program. I started by giving the learner a view of the entire UI, then zoomed in on the Player itself. 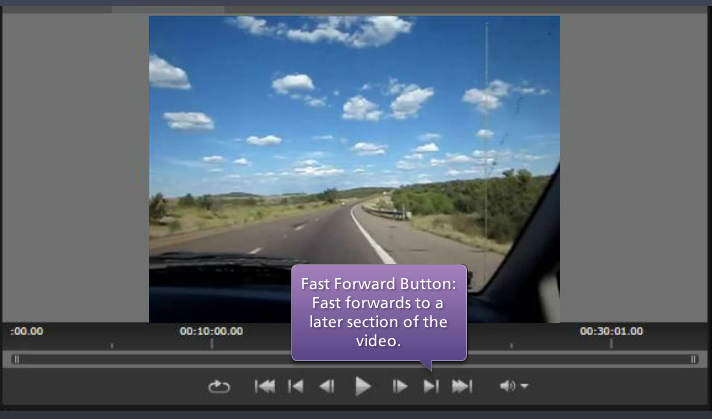 By simply using hotspots, triggers and layers in Storyline, I created a second slide where learners could click on each of the controls of the player for a description of what they do. Then it was time for the learner to get their hands dirty and try out the controls themselves. It’s just a simulation Jim! Because this was just a simulation and not the actual program, I needed to be sure learners could only click one button at a time following my instructions. Otherwise, there would be no way to predict where in the video they would be when they hit the rewind button for example, unless you knew where they’d left off. To accomplish this, I created individual images of all the player control buttons and used Storyline’s “Hidden” state to hide them when I didn’t want learners to click them. Underneath all those images, I still had a picture of the entire player including the controls, so learners would still see them – even when the “clickable” images of them (on top of the picture of the player) were hidden. A trigger to either play a video or change the state of a picture (a still shot of where the video would be) from Hidden to Normal. I should mention here that I had to set the “initial state” of all the still shots to Hidden, so learners would not see them until they clicked the button with the trigger. A trigger to play the audio clip with the instructions on which button to click next. A trigger to change the state of that button from Hidden to Normal. A trigger to change the state of the button they just clicked from Normal to Hidden – remember, I don’t want users to be able to click any other buttons because I need to control the order in which they click them to make the simulation work properly. In one instance I had to set a trigger to take learners to the next slide. I only did this once, because I had a second video showing the looping effect and thought I might be pushing my luck placing a second video on top of the first one on the same slide with all the other triggers and things going on. I guess I’d say that was a “judgment call”. So, do you want to see the finished product? Just click here. As always, if you need any clarification on how to do this, feel free to comment below and I’ll get back to you. I hope you enjoy creating your own software simulations. I also welcome you to check out David Anderson’s Weekly Challenge blog at E-Learning Heroes. It was because of his latest challenge that I created this simulation. You have an e-learning course where your client wants the Take Quiz box to appear on the main menu, but doesn’t want learners to be able to take the quiz until after they’ve visited all the sections in the course. They also want learners to have the option to take the different sections in any order they wish. As learners complete each section, they’ll return to the main menu. After they’ve completed all the sections, the Take Quiz box will become active so they can take the final quiz. Does this sound tricky? Fortunately, I’ve been there and can show you how to make it happen. I needed two versions of the Take Quiz box; one that was clickable and would take learners to the final quiz, and one that was not. I named one “TQ With Link” and the other “TQ No Link”. 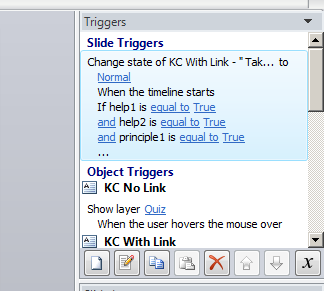 Learners will see the “TQ No Link” box until they complete all the sections, at which time the “TQ With Link” will appear. I put the “With Link” version on top of the “No Link” version in the timeline. Both boxes look the same to the learner, with the exception of what they say if the learner rolls over them. Since this requires that the boxes be the same size and in the same position, you can either select them in the timeline, or have one of them off to the side and set its final position after you’re done working on them. Either way, it’s a good idea to name them in the timeline to keep them straight. For the “TQ With Link” box I created four states: an initial state of Hidden, and three other states; Normal, Hover, and Visited. For “TQ No Link” I created two states: Normal and Hover. So learners would understand why and when the Take Quiz box would be active, I created a layer called “Quiz” that said “Not available until all other sections completed” and added a trigger to make the “Quiz” layer appear when learners rolled over “TQ No Link”. Then I created another layer called “Quiz 2” that said “Ready for a final quiz?” and added a trigger to make the “Quiz 2” layer appear when learners rolled over “TQ With Link”. 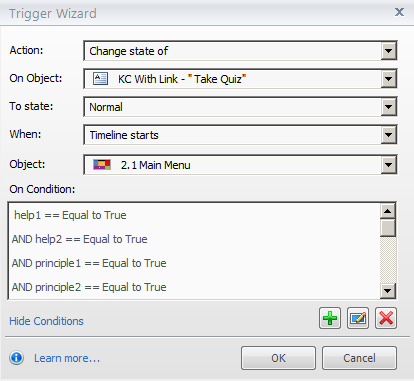 And of course, I added a trigger to “TQ With Link” to go to the Quiz when the user clicks on it! Next, I needed a way for Storyline to know when each of the sections were completed. To do this, I created a variable and a trigger for each section. I gave each variable a unique name I’d easily associate with the particular section and had them all start with a value of False. Then I went to the last slide of each section and created a trigger that changes the value of that variable to True when the timeline for that slide starts. That way, Storyline would know when the learner got to the last slide of each section, that meant they had successfully completed that section. Lastly, on the main menu slide I added a trigger that changed the state of “TQ With Link” to Normal when the timeline for the slide starts AND when all the variables for all the other sections changed to True. 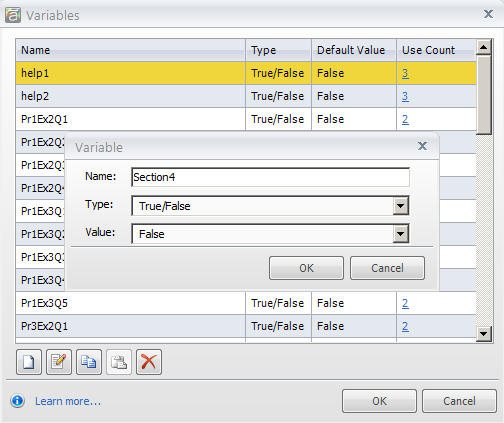 Because when all the variables for all the sections are True, we know that all the sections have been completed. 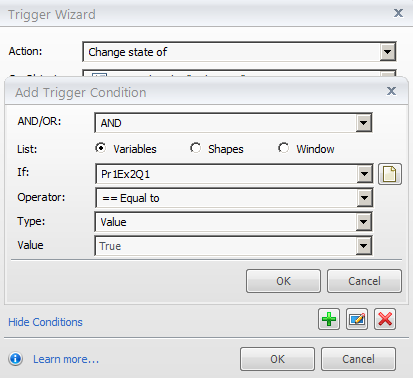 When setting up this trigger, click the + sign to add as many variable changes as you need. ONE CAUTIONARY NOTE: I initially tried to just have the trigger activate when all the variables changed, but learned that that wasn’t enough, you also need to tell it to do it when the timeline for the slide starts. To see a stripped-down version of how the menu looks and works, click here. As always, I know some of this can be a bit challenging. So feel free to contact me if you have any questions about any of these steps.